Who says you can't look cute when you're lounging? 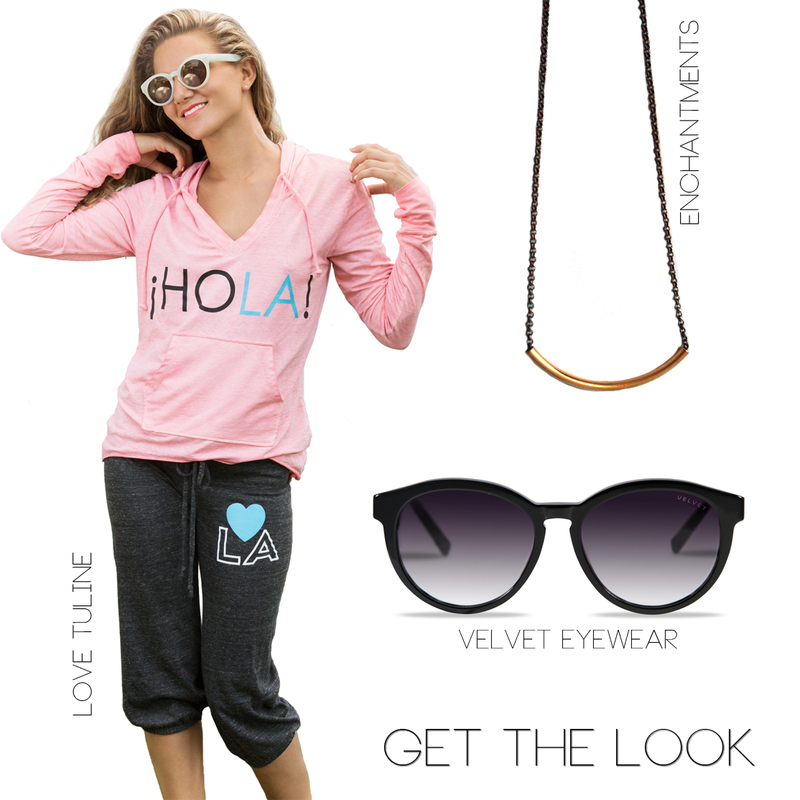 Say hello with the Love Tuline "HOLA" hoodie, paired with the "LOVE LA" crop pant. A lounge wear outfit wouldn't be complete without sunnies. The "Bella" by Velvet Eyewear is your go-to style for that perfect fit. The frame is rich handmade acetate, and the lenses offer 100% UV protection and optical quality for clear, distortion free vision. The "Gold Bar on Silver Chain" Necklace, by Enchantments' Minimalist Collection is the perfect "everyday" piece to complete this lounge wear look. Love Tuline is a trendsetting women's lifestyle brand that combines beach and city style, perfect for any California gal. Love Tuline is designed by Pratt Institute Grad, and Project Runway Season One Alumni, Nora Caliguri. Get the look aboard the pink mobile boutique at an upcoming stop, or email info@lefashiontruck.com and have it shipped directly to you.